Þegar þú ert að vinna með litlum skjár tölva, eins og fartölvu, eða vafraðu vinnubók með of miklum gögnum, hefurðu einhvern tíma reynt að fá stærra beit svæði með því að skipta yfir stöðustikunni, formúlunni og borði? Ef svo er, með þessu Vinnusvæði Stærð þú getur fljótt skipta á milli eftirfarandi 3 gerðir vinnusvæði stærð í Excel þínum. Smelltu á fyrstu hnappinn mun endurstilla Excel til venjulegs vinnusvæðis stærð. Smelltu á hina 3 hnappana skipta á milli 3 gerðir vinnusvæði stærða í Excel þínum. Smelltu á aðra hnappinn, stöðustikan fyrir neðan vinnubókina verður falin. Smelltu á þriðja hnappinn, stöðustikan og formúluborðið verður falið. Smelltu á fjórða hnappinn, stöðustikan, formúluborðið og borðið verður falið. Kutools fyrir Excel: með fleiri en 200 handhægum Excel viðbótum, ókeypis að reyna án takmörkunar á 60 daga. Niðurhal og ókeypis prufa núna! Eftirfarandi verkfæri geta mjög sparað tíma og peninga, hver er rétt fyrir þig? Office flipi: Nota vel flipa í skrifstofunni þinni, sem leið fyrir Chrome, Firefox og New Internet Explorer. 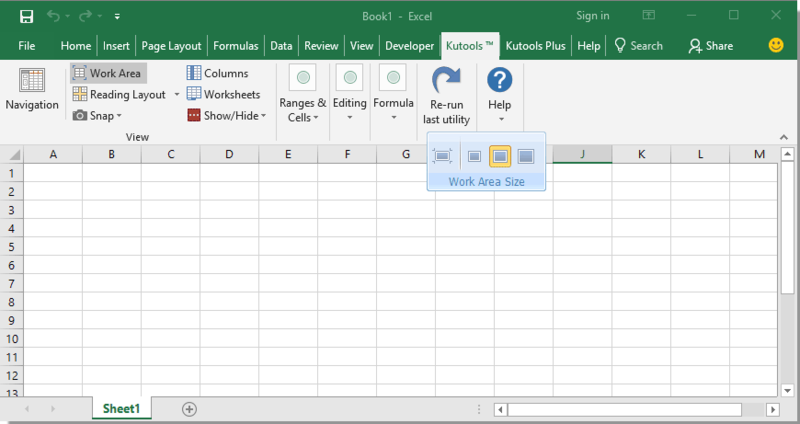 Kutools fyrir Excel: Meira en 300 Ítarlegri Aðgerðir fyrir Excel 2019, 2016, 2013, 2010, 2007 og Office 365. Classic valmynd fyrir skrifstofu: Komdu aftur með kunnugleg valmyndir til skrifstofu 2007, 2010, 2013, 2016, 2019 og 365, eins og það væri Office 2000 og 2003. Virkni sem lýst er hér að ofan er bara einn af 300 öflugum hlutverkum Kutools fyrir Excel. 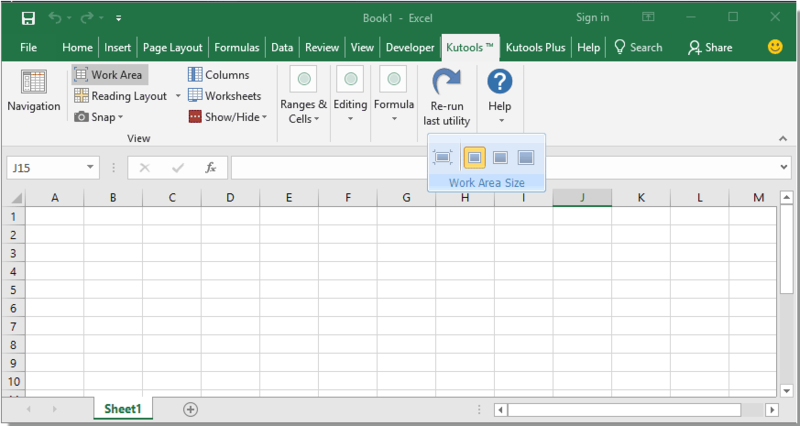 Hannað fyrir Excel (Office) 2019, 2016, 2013, 2010, 2007 og Office 365. Frjáls niðurhal og notkun fyrir 60 daga. I had the same issue that Marion and Terry had (3 years ago!) but I don't think the question was understood - when I select the WORK AREA button, the ribbon goes away & the spreadsheet window is maximized (correctly), but there is no floating 'work area' icon. Without that icon, there is nothing I can do to bring back the ribbon except quit Excel & re-start it. ** I have just discovered that 'work area' icon - it was floating on a second monitor!!! I didn't see it because it was lost in my other windows. I had to ALT-TAB to find it. I would suggest to KuTools, that you add this icon to the navigation window that is defaulting to the left margin. Also - when I restore the work area, my Excel maximizes in its monitor. I only want it to return to its original window size. This may be particular to WIndows 10, or Excel 2016, or something else, so it could be a bug; but if everyone else has this happen, then it should be fixed in future versions - perhaps add a choice: 'return ribbon & window to original size' or 'return ribbon & maximize window'? I was working on my second screen. When I moved Excel back to the first screen the floating tool bar appeared. 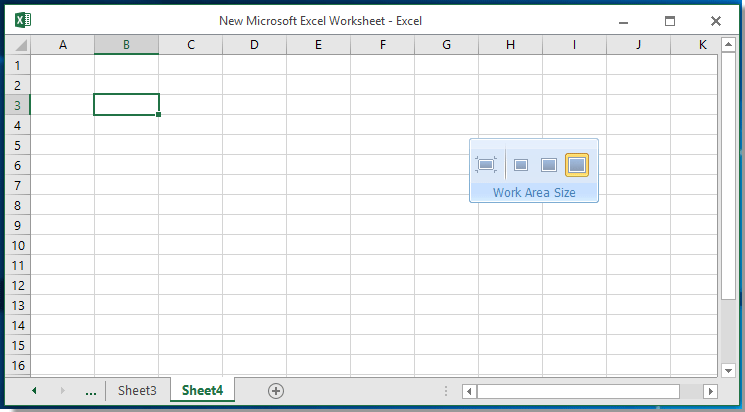 Why does the toolbar not follow excel to the second screen? I have the same problem. I clicked on the work area button and the ribbon, the status bar and the formula bar dissapeared. I do not have the floating menu on my sheet. How do I restore my ribbon, status bar and the formula bar ? When I select work area the floating work are toolbar is no where to be found. Can someone help? I have just started trying Kutools for Excel. I do not have the floating work area toolbar on my screen, so I don't know how to get my ribbon and status back. Can someone help me? Hello, Can you see there are Kutools and Enterprise tabs in your Excel?